In a war-torn village in Eastern Europe, an American photographer captures a heart-stopping image: a young girl flying toward the lens, fleeing a fiery explosion that has engulfed her home and family. The image wins acclaim and prizes, becoming an icon for millions—and a subject of obsession for one writer, the photographer’s best friend, who has suffered a devastating tragedy of her own. As the writer plunges into a suicidal depression, her filmmaker husband enlists several friends, including a fearless bisexual poet and an ingenuous performance artist, to save her by rescuing the unknown girl and bringing her to the United States. And yet, as their plot unfolds, everything we know about the story comes into question: What does the writer really want? Who is controlling the action? And what will happen when these two worlds—east and west, real and virtual—collide? 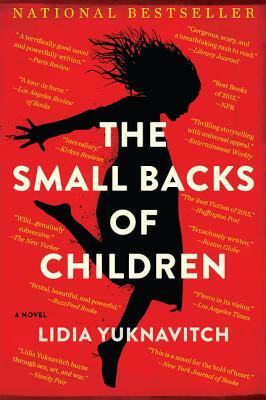 A fierce, provocative, and deeply affecting novel of both ideas and action that blends the tight construction of Julian Barnes’s The Sense of an Ending with the emotional power of Anthony Marra’s A Constellation of Vital Phenomena, Lidia Yuknavitch’s The Small Backs of Children is a major step forward from one of our most avidly watched writers.